The story of the search for a perfect language begins at the Beginning, namely Genesis 11:1. We are told that after the Flood man sought to rival God by erecting a tower to reach the Heavens. This ‘tower of Babel’ so intensely offended God that he created a plurality of tongues to punish man’s presumption. Man could never again attempt such a huge task because he couldn’t communicate effectively. So far so biblical, but the search to either re-discover or create a perfect language has occupied the minds of philosophers, theologians and linguists for more than 2000 years. It even occupies the minds of ordinary men and women today, which rather surprised me. I started receiving emails from Volapük speakers shortly after I’d followed a hunch courtesy of Wikipedia. 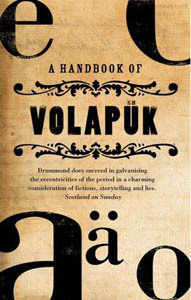 The hunch in question was that Volapük, the universal language featured in Andrew’s Drummond’s second novel, A Hand-book of Volapük, actually existed. With hindsight this appears obvious, but at the time I was caught up in Drummond’s dexterous interplay of fact and fiction. On the title page, ‘old’ adverts and layout imitated a nineteenth century design; the preface is ‘written’ by a Victorian phrenologist who discovers a ‘Volapük Hand-book’ in mysterious circumstances, near Roslin (a swipe at that particular obsession). I was reminded forcibly of Alasdair Gray and was accordingly on guard. I should have inverted my suspicions, because Drummond portrays fact as fiction. ük, which until my Wikipedia moment had led me to perceive Drummond as a linguistic genius. These lessons move from ‘sounds and letter’ through to the rather more demanding ‘frequentative and aorist forms’. I began by assiduously trying to learn something, and concluded by skipping most of the lesson until I came to the examples, which were always pertinent to the narrative. The ninth chapter includes the example binom temipelum ka ob, which translates as ‘he is more of a coward than I’. At this point in the novel the protagonist’s once colleague, now Esperanto-apologist enemy, Dr. Bosman, is close at hand. The examples are Drummond’s own, customised for his unreliable narrator, Gemmell Hunter Ibidem Justice. Volapük speaker Jim Henry informs me that Drummond adapts these lessons from a real Hand-book of Volapük that was written by Charles E. Sprague in 1888. Re-reading Drummond’s novel I pick up references to Sprague. Drummond’s narrative is, at first glance, amusingly fantastic. Sir Thomas Urquhart is a strange character, several centuries older than he should be, who has a biblical obsession with mice. He also has an affinity for universal languages and coins words by the sentence, Take my nobles, find a willing conductor – but do not superlucrate him! he orders Mr Justice, whose look of bewilderment invites further elucidation, Do not pay him to much, you loggerheadistic minion! Drummond also throws in a hot air balloon, a lunatic asylum and a highly unreliable census. This marriage of a fantastic narrative with the idea of a universal language feels comfortably modern. A number of science-fiction authors refer to a planned language in their work. Robert Heinlein casually mentions Interlingua, Esperanto and ‘Basic’, Harry Harrison’s Stainless Steel Rat series postulates a future where Esperanto is used for all interplanetary communication. To clarify, these works suggest that a planned language might have a positive role to play in society, even if it isn’t a society we recognise as our own. George Orwell of course writes of a planned language, Doublespeak, in 1984 but this is a tool for suppressing free thought rather than enriching society. Volapük speaker Ken Caviness says that the idea of a universal language seems to be something that crops up again and again – in fiction. In today’s society the idea of a successful universal language is far removed from any concept of reality. It is hardly even a day-dream. British attempts to communicate on the international circuit formally emphasise the role of translators, and informally wish that everyone would learn to speak English. Problems arise when people do not really have any desire or need to communicate with people outside their social/religious group. Reuters is said to have shifted recruitment from European language speakers to candidates who speak Arabic and Chinese. Soldiers in Iraq are primed, at least in theory, to distinguish between phrases such as ‘I mean no harm’ and ‘I’m going to kill you.’ The need for a ‘universal language’ is strong, but the idealistic will to enforce one is weak. The question as to whether one might work – whether one language can communicate the experiences of people from vastly different cultures – is also important. Hence why it is often through the prism of science fiction that a universal language is posited, if at all. ük is as close to hand as the apocalypse. Theirs is a specialist rather than an idealistic society. With some humour, Drummond invents the mighty Cödel Yagöl to suggest the kind of agency needed to ensure the general public learn a universal language (preferably Volapük). The ancient Sir Thomas provides Mr Justice with the cloak, scimitar and helmet of this supernatural figure. When Mr. Justice wears these items his view of the world becomes distinctly semiotic, whilst his manner – or armour – is strangely persuasive. When faced with this figure even the unrepentant Dr. Bosman becomes a word-perfect Volapük afficado. Only by such a deus ex machina can a universal language achieve success: especially when faced with such rough material as the Self-Betterment League of Peterhead and the Didactic Society of Newburgh Linoleum Workers. ük conferences, societies, and the ill-fated 1891 census. The Mavisbank lunatic asylum and the unfortunate balloonist are also based on actual people and events. 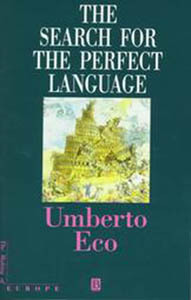 The more you read about universal languages, the greater your sense of both their strangeness and cultural relevance. Postel, like the characters in Drummond’s book, led a strange life dedicated to the cause of a universal language. He was unusual, but by no means unique. Eco also explores the incredible etymologies that were used to justify the claim of one perfect or prototype language over another. Fabre d’Olivet, author of La langue hebraique restituee, constructed an etymology for the French term emplacement. This was used to show that traces of Hebrew could be discovered in a modern language. Place derives from the Latin platea and from the German Platz. In both these words, the sound AT signifies protection, while the sound L means extension, LAT means, therefore, a ‘protected extension’. This continues for some time. Although Sir Thomas coins words rather than traces their etymology, there is a certain parallel between his particular linguistic creativity and that of Olivet. Reading Eco, I felt drawn into a world that was both strange and strangely hopeful. Throughout the centuries men and women were tying their tongues – and possibly their cerebrums – in knots, as they undertook an impossible search for an impossible dream. The reward seemed to be massive, akin to finding the Holy Grail. A perfect language would solve religious and political strife; undoing Babel and the confounding of man. By finding this language man might know himself. Of course it was a dream, which is partly why I find it so hard to differentiate between fact and fiction in Drummond’s book. Instead of success, there is absurdity and failure. But it seems premature to consign universal languages to the colder reaches of science fiction. They are as feasible today as they always were and the need, if anything, is greater. Both Drummond and Eco’s books show they play – and can still play – an intriguing role in society. They are a symbol of hope, as much as a practical tool for communication.